Flickr is a popular online photo sharing website that allows users to attach information to the pictures such as keyword tags, date, time, and location the picture was taken, and even the kind of camera that took the picture. Although pictures can be made private, many are uploaded publicly. 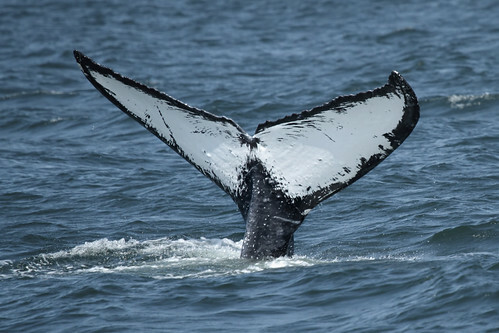 This online public database is now being used to help save the whales. I first came across this project on the CNN website. People are using pictures of whales, particularly pictures of their tails which have unique markings that can be used to identify individual whales, combined with the date and location information of the pictures to track whales’ migration. One whale that was tracked via Flickr was found to have a longer migration route than any other previously recorded migration route. These citizen scientists are helping further scientific research. Crowdsourcing solutions to problems is no longer uncommon, particularly via games. Newspapers have made a game out of combing through online documents on government spending, thereby turning readers into investigators. Fold It is a game in which players twist and untwist actual molecular structures to further science in ways that computer modelling cannot. Jane McGonigal has created a game called Evoke that challenges a community of players to share and evaluate solutions to the world’s problems. The U.S. Navy has adopted a similar approach to fighting piracy. Can language teachers create similar games for language learning? Perhaps. Julie Sykes has created a location-aware game called Mentira which sends students into an actual Spanish-speaking neighborhood near the University of New Mexico campus to solve a fictional mystery set decades in the past. Students who have finished the game are now involved in writing and rewriting it to add more detail and different possible outcomes. Given the game-like nature of language learning (learners learn skills to level up) there are lots of options for teachers– from encouraging students to become involved in the above activities to creating new games for students. If you know of other examples, leave them in the comments.